Life is noisy. But what would happen if every day – for the next 40 days – you soaked in God’s love as He intimately whispered words of rest just for you? 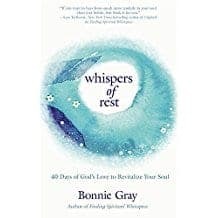 WHISPERS OF REST is a 40-day devotional detox for your soul, a spiritual journey to refresh you and guide you to greater peace, while helping you discover who God truly made you to be: His beloved. Renew your spirit with powerful affirmations of God’s love with uplifting words of Scripture, journaling prompts for reflection, and practical challenges to spark joy. Bonnie will lead you to places of rest, where you can deeply experience the Savior’s presence in your everyday life. Soul Care Tips & Trail Notes – Reduce stress and nurture your body and spirit. Daily Beloved Challenges – Brighten your day by taking simple soul care actions. A Simple Prayer Practice – Deepen your intimacy with God through easy-to-enjoy prayer prompts, inspired by classic devotional practices. A lot can happen in 40 days. A new rhythm. A new heart. A renewed faith. Transform your life as you take the journey to say yes to God, embrace your true identity, rediscover your dreams, and begin your healing. Dare to enjoy each day fully and celebrate your calling as the beloved.